Peritoneal mesothelioma is a cancer that forms in the tissue lining of the abdomen (peritoneum). It is caused by ingesting asbestos. It is the second-most common type of mesothelioma. Half of patients who elect surgery with heated chemotherapy live at least five years. Dr. W. Charles Conway, a peritoneal mesothelioma expert, explains how the disease develops, statistics, survival rate and treatment care. Peritoneal mesothelioma is a rare asbestos-related cancer that forms on the abdominal lining. The beginning symptoms of peritoneal mesothelioma include abdominal distension, abdominal pain, swelling or tenderness around the abdomen and constipation or diarrhea. It accounts for less than 20 percent of all mesothelioma cases. Surgery and heated chemotherapy are the most effective treatments. Immunotherapy for this type is available through clinical trials. Peritoneal patients generally live four times longer than pleural mesothelioma patients. The survival rate of someone diagnosed with peritoneal mesothelioma depends on the stage of the cancer, types of treatments the patient undergoes and the quality of the specialist treating the patient. Surgery plays a major role in long-term survival. Patients who don’t qualify for surgery live around one year. About half of patients who undergo surgery and heated chemotherapy are alive more than five years later. Although clinical trials for peritoneal mesothelioma are not as abundant as those for pleural mesothelioma, researchers are studying whether immunotherapy combined with chemotherapy could play a bigger role in controlling the cancer by boosting the body’s immune system. 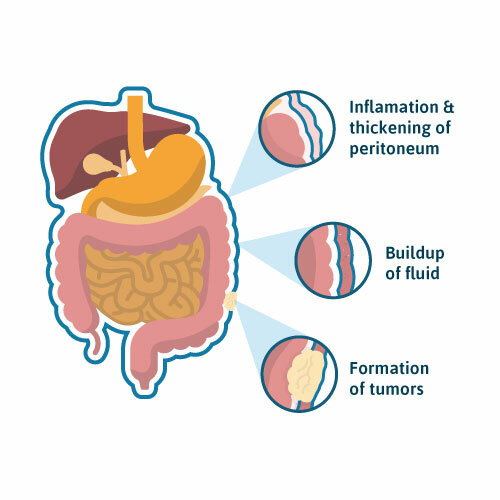 The peritoneum is a protective membrane with two layers that surrounds the abdomen. Peritoneal mesothelioma can develop on both layers. The parietal layer covers the abdominal cavity and the visceral layer surrounds the stomach, liver and other organs of the abdomen. Together, the layers support the abdominal cavity and its organs. Asbestos exposure is the primary cause of peritoneal mesothelioma, also known as abdominal mesothelioma. Swallowed asbestos fibers travel from digestive system to the peritoneum. Inhaled asbestos fibers travel from lymphatic system to the peritoneum. The irritated cells begin to thicken the peritoneal lining. Research on other causes of abdominal mesothelioma is scarce. Evidence shows other fibrous minerals, such as erionite, and radiation to the abdomen trigger some cases of this disease. What Are the Symptoms of Peritoneal Mesothelioma Cancer? Symptoms of peritoneal mesothelioma range from those associated with the location of the tumors near the abdominal cavity to symptoms that resemble other less serious conditions such as the flu. The latest advances in medical technology allow doctors to diagnose this disease earlier than ever before. Yet, experienced cancer doctors can struggle to diagnose it accurately. In fact, the process can take months. The process of diagnosing peritoneal mesothelioma is like other types of mesothelioma. It starts with a thorough examination of your medical history, occupational history and overall physical condition. A series of tests, including imaging scans and biopsies, usually follows. Be sure to mention any history of asbestos exposure, even if your doctors forget to ask. It’s important to share every detail you can remember. This includes dates when the incidents occurred and the length and duration of the exposures. This information will alert your doctors about the possibility of an asbestos-related disease and help them determine the appropriate next steps. Vague abdominal discomfort is very nonspecific, making the history of asbestos exposure important in guiding diagnostic tests. Because this cancer is so rare, doctors lacking experience with the disease often misdiagnose mesothelioma patients with more common illnesses that share similar symptoms. This is a serious misstep that delays proper treatment. Peritoneal mesothelioma symptoms, such as abdominal swelling, weight loss and hernias, also arise in other abdominal cancers and many less serious conditions. This overlap of symptoms increases the likelihood of a misdiagnosis. If you have a history of asbestos exposure, the best way to ensure an accurate diagnosis is to schedule an appointment with a specialist. Doctors who specialize in mesothelioma have the knowledge and tools needed to make a prompt diagnosis. They can explain all the mesothelioma treatment options available to you. When a patient is experiencing symptoms, doctors likely will ask for a chest X-ray, CT scan or another type of imaging scan. These tests will detect potential tumors and show any cancer spread. They also help doctors choose the best biopsy locations. It’s important to note that a CT scan can diagnose ascites (fluid in the abdomen). In the absence of liver disease, it is extremely important to pursue the cause of ascites. Biopsies are minor procedures that extract fluid and tissue samples for inspection under a microscope. This is an essential step in the diagnostic process because only a biopsy confirms a peritoneal mesothelioma diagnosis. Sometimes doctors need to perform a laparoscopic surgical biopsy, which is more invasive. In both cases, pathologists look to see if lab results show cancerous cells in your peritoneal fluid or tissue. Testing biopsy samples with chemicals called antibodies is important for confirming a mesothelioma diagnosis. Antibodies used to confirm peritoneal mesothelioma include calretinin and podoplanin. Mesothelioma tumors are composed of cells classified by their structure and composition. The three major cell types of peritoneal mesothelioma include epithelioid, sarcomatoid and biphasic. Epithelioid mesotheliomas are the most common and respond best to treatment. Sarcomatoid cells are the least common and respond poorly to treatment. Biphasic tumors are made of epithelial and sarcomatoid cells. The response of biphasic mesothelioma to treatment depends on the ratio of epithelioid to sarcomatoid cells. Because rare subtypes of these cells exist, pathologists face challenges in diagnosing cancer in the abdomen. Additional histological variances of peritoneal mesothelioma include adenoid cystic, tubulopapillary, microcystic, signet ring, diffuse, not otherwise specified (NOS), pleomorphic and well-differentiated papillary. A patient’s cell type can significantly impact their prognosis. Mesothelioma patients with epithelioid tumors live an average of 200 days longer than patients with sarcomatoid tumors. An often misdiagnosed type of sarcomatoid mesothelioma. When it develops alongside epithelial cells, a biphasic peritoneal mesothelioma diagnosis is made. A type of sarcomatoid cell that occurs in peritoneal and pleural mesothelioma. The cells are composed of more than 50 percent fibrous tissue that produces collagen. A rare variant of epithelial mesothelioma. It has been diagnosed in roughly 45 mesothelioma cases. Around half of deciduoid cases develop in the abdomen. Imaging scans help doctors estimate the stage of the mesothelioma. These tumors initially form on the lining of the abdomen. As the tumors grow and spread, they migrate outside the lining to lymph nodes and distant organs. For decades, peritoneal mesothelioma experts developed their own staging system because an official one didn’t exist. Since then, researchers have proposed three stages. A fourth stage is not yet clearly defined. It is generally accepted that patients with extensive tumor spreading are classified as stage IV. Cancerous tissue is minimal and tumors are contained within the abdominal lining, and lymph nodes are free of cancer. Cancerous tissue is moderate and tumors have not spread outside the lining or to lymph nodes. Cancerous tissue is more extensive and tumors may have spread outside the peritoneal lining, to lymph nodes or both. Although an increasing number of specialists have emerged as treatment leaders for abdominal cancer in recent years, the total number of peritoneal mesothelioma specialists remains small. If there are no peritoneal malignant mesothelioma specialists nearby, you may consider one in a neighboring state. Treatment for this type of mesothelioma includes surgery, chemotherapy and experimental therapies such as immunotherapy. Doctors believe combining traditional treatments often works better than any single treatment. A combination of one or more treatments is called multimodal therapy. Research shows that a multimodal treatment approach usually offers the best improvement in terms of survival. The most promising peritoneal mesothelioma treatment is cytoreductive surgery combined with heated intraperitoneal chemotherapy (HIPEC). While doctors only perform surgery with HIPEC on a case-by-case basis, it has extended survival and improved quality of life. In studies on small groups of patients, around half lived five years or longer. To qualify for surgery with HIPEC, a patient’s cancer must be limited enough for doctors to completely remove with surgery and not have spread beyond the abdomen. In addition, qualifying patients must be physically fit in order to tolerate the stress of anesthesia and surgery. Dr. Conway discusses the best treatment for peritoneal mesothelioma and the potential side effects. Surgery is the most promising traditional treatment option for peritoneal mesothelioma in the abdomen, but it is only effective for early-stage cancer. Because doctors most commonly diagnose asbestos-related diseases after the cancer has spread, most surgeries only attempt to remove sections of the tumor. Surgery can be curative or palliative. Curative surgery aims to remove as much of the tumor as possible in hopes of curing the cancer. Otherwise, doctors may perform palliative surgery, which aims to remove parts of the tumor to relieve symptoms, including bowel obstruction, extend survival and improve quality of life. Palliative therapies do not stop the cancer. Tumor spread is usually too vast once it reaches beyond the abdomen for surgery to completely remove the cancer. Surgery with a curative intent is not recommended after the cancer has spread. However, a surgery to remove the majority of tumors may be performed to alleviate pain and improve symptoms such as abdominal distention and pain. Typical surgeries include peritonectomy and cytoreductive surgery, bowel resection and removal of some organs. Another minor surgical procedure, known as paracentesis, is commonly used on peritoneal mesothelioma patients. A small incision in the abdomen is made to withdraw excess peritoneal fluid, called ascites. This procedure reduces abdominal swelling and pain. Chemotherapy drugs can shrink peritoneal mesothelioma tumors and slow the growth and spread of cancer. It can be given before, during or after surgery. In some cases, doctors offer chemotherapy as the only treatment option. Chemotherapy drugs considered effective against peritoneal mesothelioma include pemetrexed, cisplatin, carboplatin and gemcitabine. In 2017, Dr. Paul Sugarbaker reported improved survival among patients who received early post-operative chemotherapy and long-term chemotherapy after cytoreductive surgery with HIPEC. All chemotherapy was intraperitoneal chemotherapy, meaning it was applied only to the peritoneum. No systemic chemotherapy was used in the study. Of the 29 patients who had surgery with HIPEC, post-operative chemotherapy and long-term chemotherapy, 75 percent lived longer than five years. In appropriate patients, the main treatment will be cytoreductive surgery with HIPEC. The surgical part removes all gross tumors with residual deposits smaller than 2 mm. The HIPEC treats the residual tumor and microscopic cancer cells the surgeon can’t see. Some studies show radiation therapy can improve peritoneal mesothelioma survival slightly when combined with surgery and chemotherapy. However, doctors tend not to recommend radiation for these patients. Even though targeted radiation can shrink tumors and slow cancer growth, the procedure is risky because of the location of these tumors. The peritoneum wraps around the stomach, liver and intestines. Aiming radiation at nearby tumors could harm these organs and cause life-threatening damage. Alternative treatments and emerging therapies are available, but these treatments have less predictable outcomes. Immunotherapy boosts the body’s immune system to help fight cancer. Research on this emerging therapy mainly focuses on the treatment of pleural mesothelioma, which develops in the lining of the lungs. Many patients find hope in clinical trials, which are medical studies that test new and experimental treatments. Research from clinical trials helps improve treatment outcomes for future patients. If you or a loved one has been diagnosed with peritoneal mesothelioma, you may qualify for financial compensation. The number of new peritoneal mesothelioma cases is low. About 500 patients are diagnosed each year in the U.S. The number of people in clinical trials for this cancer is even smaller. You can talk to your doctor or a patient advocate at The Mesothelioma Center about whether a mesothelioma clinical trial is right for you. A recent example of a peritoneal mesothelioma clinical trial is the drug tremelimumab. The study recruited patients to test tremelimumab’s effectiveness against mesothelioma. It’s an immunotherapy drug that signals the immune system to attack malignant mesothelioma cells. The study paired tremelimumab with chemotherapy to increase effectiveness. In 2017, Ochsner Medical Center in New Orleans opened a clinical trial to study the effects of a new immunotherapy drug in combination with chemotherapy for peritoneal mesothelioma. Peritoneal mesothelioma is such a rare cancer that few oncologists have experience treating it. Thankfully, a handful of surgeons and oncologists across the country have chosen to specialize in this type of mesothelioma. They work at comprehensive cancer centers equipped with cutting-edge technology, and they can get you access to clinical trials. Dr. Suzanne Schiffman is a surgical oncologist at the Allegheny Health Network Cancer Institute with an expertise in complex abdominal malignancies. She has been specially trained in cytoreductive surgery and hyperthermic intraperitoneal chemotherapy. The rate of cancer progression is highly variable in this type of mesothelioma. It is hard to predict individual prognosis. In the ’80s and ’90s, average survival time was around one year. Today, more people are living longer with this disease. Survival is significantly longer for patients who qualify for surgery with heated chemotherapy. Nearly half of these patients live longer than five years. More than 60 percent of patients are diagnosed too late to qualify for surgery. These patients often elect chemotherapy. The combination of cisplatin and pemetrexed delivered systemically has a response rate around 30 percent with average progression-free survival around 11.5 months and median survival around 13 months. Chemotherapy delivered directly, not systemically, to the peritoneum without surgery has a higher response rate of 47 percent. Meanwhile, heated chemotherapy delivered during surgery has a response rate of 84.6 percent. Women tend to live longer with peritoneal mesothelioma than men. When short- and long-term survival is averaged out, women live an average of 13 months, and men live six months. The median survival of untreated peritoneal mesothelioma is six months. Patients with tumors containing epithelial cells live longer than patients with sarcomatoid or biphasic cells. The tumor’s grade also impacts prognosis. Tumor grade is based upon how abnormal the cells appear, which indicates how quickly they are likely to grow and spread. Surgical oncologist and peritoneal specialist Dr. W. Charles Conway is director of surgical oncology at the Ridley-Tree Cancer Center in Santa Barbara, California. He specializes in gastrointestinal cancers and peritoneal surface malignancies, including mesothelioma. Dodson, R., & Hammar, S. Asbestos: Risk Assessment, Epidemiology, and Health Effects, Second Edition. Taylor & Francis: Boca Raton, 2012. Bridda, A. et al. (2007). Peritoneal mesothelioma: A review. Med Gen Med., 9(2), 32. Pass, I., Vogelzang, N., & Carbone, M. Malignant Mesothelioma: Advances in Pathogenesis, Diagnosis, and Translational Therapies. Springer: New York, 2005. NYU Langone Medical Center. (n.d.). Is your patient a candidate? Sugarbaker, P.H., & Chang, D. (2017). Long-term regional chemotherapy for patients with epithelial malignant peritoneal mesothelioma results in improved survival. International Journal of Hyperthermia, 33(5), 582-592. Magge, D. et al. (2014). Malignant peritoneal mesothelioma: Prognostic factors and oncologic outcome analysis. Annals of Surgical Oncology, 21(4), 1159-1165. doi: 10.1245/s10434-013-3358-y.